Our readers may note that NPQ has long been following the development of the “Fight for 15” movement. This past Tuesday marked the four-year anniversary of the movement’s first protest event, back in November 2012. 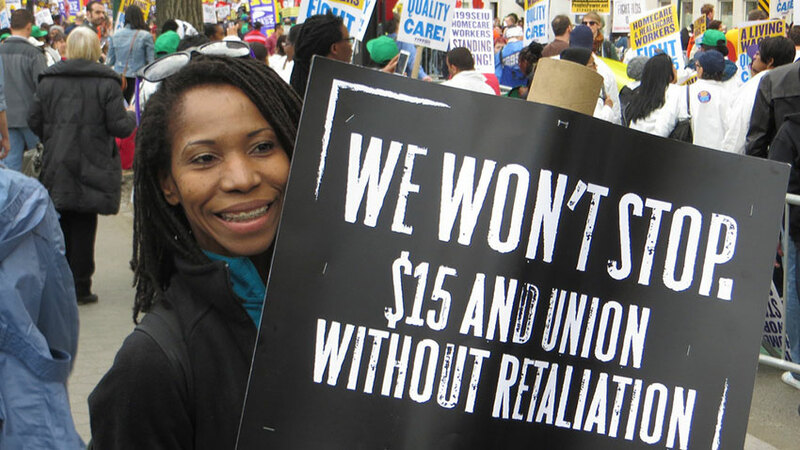 The National Employment Law Project (NELP) reminds us that the date marks the day that New York City’s fast food workers first “walked off their jobs demanding $15 an hour and union rights.” The movement has come a long way. While 200 workers took part in that one-day strike four Novembers ago, thousands have now risen nationwide, spanning across 340 cities to mark the event. Chicago O’Hare airport alone witnessed 500 workers on strike. The movement has not only continued, but grown. Its growth keeps the U.S. political debate over minimum wage on the agenda. The movement is credited for notable victories in passing $15 minimum wage laws that would phase in over the next few years. Indeed, voters nationwide have approved minimum wage increases by 2020, as reflected in wage ballots. There were prominent victories in the District of Columbia and across state legislatures in California, N.Y., and Washington. A NELP report further debriefs us on the movement’s impact. According to the report, pay increases for 17 million Americans can be attributed to the movement; altogether, these increases amount to $61.5 billion, “more than 10 times larger than the total raise received by workers in all 50 states under Congress’s last federal minimum wage increase, approved in 2007.” The report also indicates that pressure from the movement may have led to voluntary wage hikes in prominent companies that include Walmart and Starbucks. Also, the report is said to include workers who already earn more than minimum wage, many of whom will have their pay raised due to ripple effects. Yet, such effects can be unpredictable. This may ring especially true for nonprofit organizations, which, with changes to the federal FLSA overtime regulations (now blocked by a federal judge), may have to resort to making once-exempt employees non-exempt and having them work “on the clock” instead of providing them with salaries that are beyond budget limits. While research at times links even modest wage increases to slight positive improvements in employment outcomes, unfortunately, as even liberal economists acknowledge, “a $15 minimum wage is uncharted territory.” In March, the New York Times quoted Ben Zipperer of the Washington Center for Equitable Growth as he explained that despite the greater benefits coming from the fact that the minimum wage increase “covers a greater share of the workforce than for past minimum wage increases, the risks of these costs are also higher.” NPQ has covered news pointing out how proportioning wage increases across staff levels, while ideal, can unfortunately risk lowering the performance levels of many nonprofit programs and services. On the brighter side, we have yet to see evidence of any negative effects from the increase toward $15. At least in the restaurant and retail industries, there have been no links between any state’s wage increases and limits to job growth.